61 Hours is the fourteenth book in the Jack Reacher series written by Lee Child. It was published on 18 March 2010 both in the United Kingdom and in the USA. It is written in the third person. Set in the town of Bolton, South Dakota, Reacher begins his latest adventure on a wrecked senior citizen tour bus after a near-miss with another motorist leaves the bus spinning on the icy road and trapped in a snowy bank. Immersed in a frozen landscape, Reacher works with local law enforcement to help the fragile victims. Hours later, Reacher learns Bolton is not like most towns. Besides its freezing, snowy climate, the town hosts one of the largest prisons in the US, making the town and its law enforcement subject to the needs and demands of the gigantic correctional facility. At the same time, a band of outlaw bikers, settled outside the town, are on edge after their leader is arrested on drug charges. As the biker awaits trial, the top priority then becomes protecting Janet Salter, the only voluntary, reliable witness to the biker's drug transaction, and Reacher agrees to aid local law enforcement in keeping her alive. Throughout the story, brutal enemies, both foreign and domestic, are encountered. The criminal mastermind from Mexico is nicknamed Plato. He dispatches an anonymous assassin to Bolton who murders anyone he suspects of knowing anything and whose ultimate target is Janet Salter. Reacher enlists the help of one of his successors, Major Susan Turner, the current leader of Reacher's old command, the elite 110th Special Investigations Unit. In the process he is compelled to divulge interesting new details of his personal and professional history and decides to make his way to Virginia to meet her. Reacher receives information about a local abandoned military installation being a former orphanage; unconvinced of this, he enlists the help of the local police who had recruited him to guarantee Janet Salter's security, searching the building until he finds an underground structure, first built as a refuge for children, but had eventually been used by the Defense Department to hide a huge amount of meth recovered by the army after the end of the war; knowing of this Plato had been using his own private forces to steal it. Reacher discovers that Plato's only accessory to removing the material from Bolton Prison could be none other than Major Holland, the local police chief. Reacher kills Holland then pretends to be him when he contacts Plato. Plato falls into the trap, going with Reacher-Hollande into the underground building where he is killed. Meanwhile, some of Plato's men had decided to take revenge on him by flooding the structure with kerosene, blowing it out. When the story ends, it is revealed that in the structure the Defense Department also hid diamonds there to avoid a scandal. Reacher manages to escape the building and tells its real story retrospectively. What heats “61 Hours” to the boiling point is Mr. Child’s decision to defy his own conventions. In the interests of pure gamesmanship he seems hellbent on doing everything differently this time. For starters, there’s the setting: recent books have found Reacher in assorted warm-weather American towns and in Manhattan. This one makes new rules by marooning him in South Dakota after a tour bus carrying 20 elderly tourists and one giant (“like a hitchhiker, but not quite”) skids off a road. 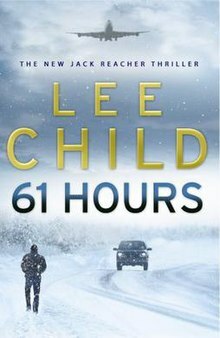 ^ "61 Hours, By Lee Child". The Independent. 21 March 2010. Retrieved 22 October 2010. ^ "61 Hours by Lee Child". The Guardian. 14 March 2010. Retrieved 22 October 2010. ^ "61 Hours (Hardcover)". Amazon.co.uk. 17 August 2009. Retrieved 19 August 2009. ^ "61 Hours (Hardcover)". Amazon.com. 17 August 2009. Retrieved 19 August 2009. ^ Maslin, Janes. "He Needs Only His Wits and the Shirt on His Back". nytimes.com. Retrieved 11 October 2014. 61 Hours information page on Lee Child's official website.